Το Ten Ekamai Suites by Aspira είναι μια πολύ καλή επιλογή για τη διαμονή σας σε Μπανγκόκ, είτε είστε τουρίστας είτε επαγγελματίας. Σε απόσταση μόνο 1 Km από το κέντρο της πόλης, οι επισκέπτες βρίσκονται στην κατάλληλη θέση για να απολαύσουν τα αξιοθέατα και τις δραστηριότητες. Από τη βολική της τοποθεσία, η ιδιοκτησία προσφέρει εύκολη πρόσβαση σε κορυφαίους προορισμούς της πόλης. Όλα γίνονται με γνώμονα την άνεση των επισκεπτών. Για τον σκοπό αυτό, η ιδιοκτησία προσφέρει ό,τι καλύτερο όσον αφορά τις υπηρεσίες και τις παροχές της. Το ξενοδοχείο σας προσφέρει μια μεγάλη επιλογή υπηρεσιών, συμπεριλαμβανομένων των δωρεάν WiFi σε όλα τα δωμάτια, 24ωρη φύλαξη, ημερήσιος καθαρισμός, ενοικίαση φορητού wi-fi, κουζίνα. Όλα τα καταλύματα διαθέτουν τις απαραίτητες ανέσεις για να εξασφαλιστεί μια ασυναγώνιστη αίσθηση απόλαυσης. Κατά τη διάρκεια της μέρας μπορείτε να απολαύσετε την χαλαρωτική ατμόσφαιρα των γυμναστήριο, εξωτερική πισίνα, κήπος. Με την ιδανική του τοποθεσία και τις καταπληκτικές του υπηρεσίες, το Ten Ekamai Suites by Aspira θα σας ευχαριστήσει σε πολλά πράγματα. Rooms are nice and comfy with cooking options and a washing machine. Pool on the roof top was a bit a let down and location, while technically in Ekamai, not very ideal since you have to walk about 5 min to the main road whenever you wanna go somewhere, be it restaurants, bts or 7/11. Totally acceptable for the price, but not the best choice if you value comfort and a nice pool more. I went with my wife and 2 year old daughter. After we arrived we were made to wait about 10 minutes while they checked the room. After checking in we went out for the afternoon / evening as it was New Year's Eve. On returning, it quickly became clear that the air-con units and their filters had not been cleaned for a long time as there was black mould and dust on them. Hence, they smelt a bit off. In the morning we got ready to go swimming and went up to the 8th floor. Only to find that the pool was closed over the New Year for renovation. This information was not available on the when we booked. So we went back to our room because my daughter was really excited about going swimming and I tried filling the bath so she could play in the water. But sadly, that was not possible - presumably because a seal was missing on the plunger style plug - because we couldn't fill the bath. The room was clean and tidy with a good sized bathroom. Our 11 month baby girl enjoyed having a safe space to crawl about. Hotel offered a free shuttle service to the BTS station and there were local Tuk Tull taxi’s near by for 50 baht to return us. Big C supermarket within walking distance to stock up on anything a family may wish to have in the kitchen in the room. Swimming pool was under renovation so could not use but this was not a significant issue. Staff really helpful and friendly. Would definitely stay again. The neighborhood is great but this is on a small side street and thus difficult to travel back and forth by foot. Better to use Tuk Tuk or Taxi. the pool was being renovated, but a nice small pool on roof. Not for swimming, mostly for lounging and getting some sun. This is a nice service apt. & hotel. Fairly small and basic, but a great option if you need a simple business hotel type of place. Recommended place..great value for your money..room is well cleaned and have a very comfortable bed.. just a little bit disappointed as my daughter was not able to use the pool as it is under renovation during our stay..but in general it was excellent place.. I stayed with this hotel for nearly 4 weeks, having extended an original booking. The room is spacious and well furnished. Building a little tatty but nothing too bad. Overall good value. Unfortunately, there was a problem with the service provided where a poor level of communication meant a number of my items were cleared and disposed of. Had i not made such a fuss i do feel the hotel would have just dismissed this, however, in fairness to them, they did agree to compensate me slightly due to their mistakes. I was looking for a home feeling stay, and thats what i got from this service apartment. However things are builded very cheaply, the wallpaper is peeling off, the shower door don't fully open, ect. I will stay here again because I found what i was looking for, I just wouldnt count of service. The elevator was out of order due to electricity outage. However, there was no way to get out since all escape stairs were blocked by office furniture and dirty laundries...the worst was that the emergency exit doors for all floors were locked. If it's in a real fire emergency, we would have been all dead. The manager on duty didn't take necessary actions as she promised...I would not recommend it even it's cheaply priced. You just don't want risk your life there. The location is good, a little bit hidden in a subsoi of Ekkamai. There are some restaurants and coffee shops around. However, the facilities were not in the best condition. Bed was perfect, although the shower did not close properly so always a mess was created during abnam. The pool was not clean, and the facilities around the pool were actually in a bad condition, it was not a wonder nobody uses it. Summarizing: the main purpose was fulfilled and the most facilities such as bed and living room were in good condition. There is electric stove, refrigerator, microwave, toaster, and kettle jug on each room.. There is no much food stall or even restaurant near Ten Ekamai Apartment, but if you walk +/- 10mnt there are couple cafes and resto.. They also have shuttle car to drop and pick you up to 'Ekamai Station', 'Big C Supercenter' (supermarket like Car**f**r) every 30mnt until 8pm.. If you confused to decide what you want to eat near ten ekamai, just go to 'Terminal 21' by Grabcar/ GrabTaxi (for +/- 120baht) --> go to level 5 (aka Pier 21), it is kind of foodcourt which sell bangkok street food in a very cheap price, but good taste and quality.. I've stayed for almost a week and it's a perfect place to be close to the city center but still away from the crowd. Very good service, got upgraded without problems because the Wifi signal in the first apartment was low. Clean, friendly staff, nice small pool, fitness center. Will definitely come here again next time I'm in Bangkok! Thank you for a great week! 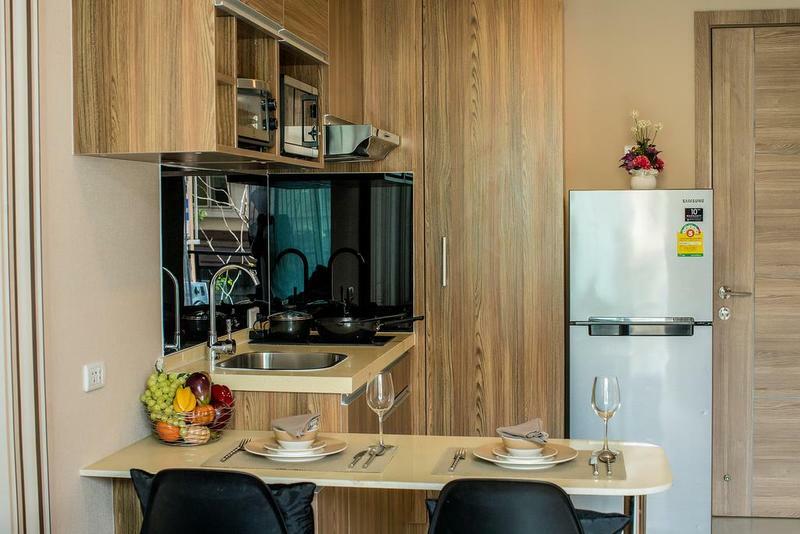 Located in a quiet alley that's 10mins walk to the busy main sukhumvit road. There's a Healthland Massage Palour just at the junction of the main road and the alley as well as several street food vendors. Staff were very helpful and friendly. The only cons/improvement the hotel needs is to provide dishwashing liquid, sponge and tea towel for our 5 day stay. I like it because its clean nice size room have everything like a apartment even have plats and spoons and forks microwave and washing machine is A+ will differently be back and stay here again if I can get a good price! 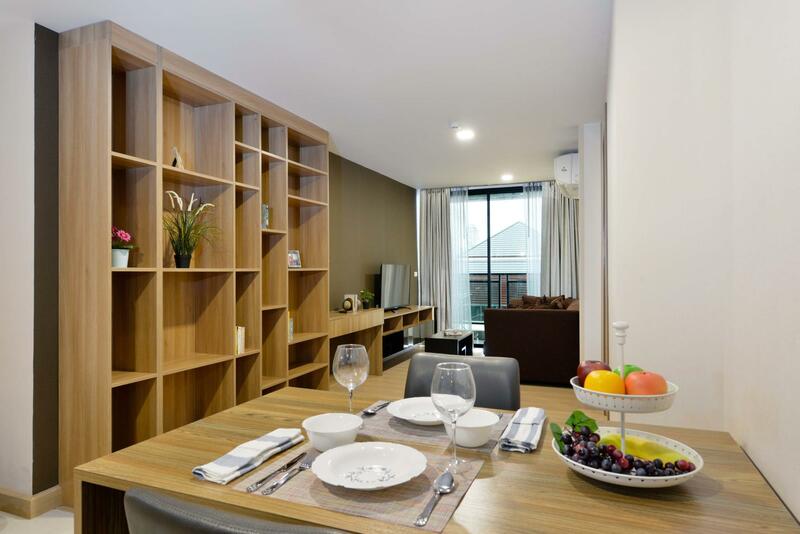 It is right in the surrounding full of restaurants, cafes and bars thus very convenient. We just parked the car at the hotel and grab taxi to nearby bar for drinks and we could easily drove around for breakfast/ lunch the next day. The room is a small studio with kitchenette, living area, bedroom and bathroom with shower and bathtub. The shower is a bit odd. The drainage sytem was poor by the shower area and there is no water stop by the shower door. So when I got our of the shower the whole bathroom just got flooded all together. Apart from that the room was lovely and clean. The first room we got stank of cigarette smoke although the whole property is non-smoking. But the staff changed our room without hesitation and we were happy with the service. Dear Eddy, Thank you for your review and sorry for a late reply. We're glad you had a good time at Ten Ekamai Suite Apartment and will be very appreciated to welcome you back again if your have a chance to visit us next time! Have a nice day! Mostly, Good & kind, but, air-con was not ckeaned. I felt bad smell whenever I turn on the air-con. And, if I left over some food on the table, many ant gather there. Sould be clean table after eating. Σταθμός BTS Ekkamai στα 1.18 χλμ.